(3) Renter Household (HH) Percentage is based off Census estimates and internal ABI projections as follows: for 2010 is 33.1%, 2011=34.8%, 2012=36.2%, 2013=37.5%, 2014=38.7%, 2015=39.3%, 2016=40.0% (est), 2017=40.5% (est), 2018=41.0% (est), 2019=41.5% (est) and 2020=42% (est). (4) Units Deliveries for 2017/18 are based on projects currently Under Construction as of 2Q 2017 (17,197 units, 50+ unit properties) with delivery expected by end of 2018. For 2019/20, projects currently Under Construction with deliveries set through 2020 + assuming that 40% (4,851 units) of all Planned units as of 2Q 2017 (12,310) will be completed by 2020 as well. Despite delivering 22,952 new apartment units from 2011 to 2016, demand vastly exceeded supply by approximately 7,100 units; if based on 2016/17 population estimates which saw Maricopa rank #1 in the country in population growth, the deficit rises to approximately 12,000 now and 18,000 by 2020. 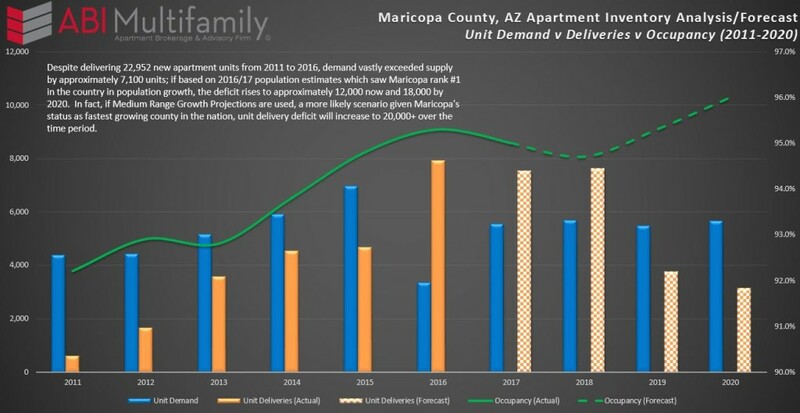 In fact, if Medium Range Growth Projections are used, a more likely scenario given Maricopa's status as fastest growing county in the nation, unit delivery deficit will increase to 20,000+ over the time period. As a result by 2020, the Occupancy Rate for the Phoenix MSA, barring any unexpected increases in current construction levels, is forecasted to reach an all-time high of approximately 96.0%. The MSA's total sales volume (10+ unit properties) decreased (29%), year-over-year, to $1.29 billion across 93 transactions representing 10,694 total units sold. California-based investors continue to be the dominant buyer of multifamily properties in the Valley accounting for 31% of total units transacted or 3,292 units, Arizona-based investors came in 2nd with a little over 2,000 units purchased and, rounding out the top five: (#3) Pacific Northwest-investors with 1,213 units purchase, (#4) Canadian investors with 1,188 units and (#5) Utah-based investors with 659 units. Sales of 100+ unit properties witnessed the greatest sales volume contraction decreasing (33%) y-o-y to $1.13B. Despite volume contraction, average price per unit amount increased approximately 14% to $125,058. Whereas 100+ unit properties saw sales volume decrease, 10 to 99 unit properties saw its volume increase 27% to $153.8M with a surge of 35% in average price-per-unit amounts to $93,297. Price-per-unit increases in the smaller property size category dovetails the sales trend which began in earnest in late 2016 through 1Q 2017, as mid-century built, extensively repositioned properties having been coming back online for sale. In fact, pre-1980's built product represented 84% of all transactions in the 2Q. The Phoenix MSA experienced a (39%) y-o-y decrease in 2Q 2017 unit deliveries with 1,620 new units delivered to the market. Nonetheless, Phoenix MSA developers are on track to deliver 7,500+ new units by YE 2017. Despite elevated unit deliveries occupancy rates for the MSA contracted slightly, (0.6%), to 95% while average rent increased 5.3% to a market record $1,000. City of Phoenix and Mesa claimed the top spots in the MSA for rent growth at 5.5% respectively, followed by Tempe at 5.4%, Glendale at 4.8% and Scottsdale at 4.4%. Although Scottsdale saw the lowest average rental rate percentage increase of the MSA, it still claims the top spot in actual average rent which at $1,291 is the highest in the region. For more national/international investors, the Phoenix MSA has long been perceived as a more secondary market when compared to the ‘gateway' markets of Los Angeles, San Francisco, Seattle, New York etc. Beginning in late 2015, amidst the run-up in prices in more coastal regions, investors turned toward more interior-core markets such as Denver and Phoenix in which to find value and yield. Given Phoenix's current business maturation, i.e. from one focused primarily on construction to the Silicon Desert and major financial services/insurance/aerospace/transportation hub, coupled with Maricopa County's ascension to top spot in population growth, will continue to propel the Phoenix MSA now and into the foreseeable future. To be followed with a more expansive ABInsight post on the topic, I want to leave you with a few thoughts, questions I have posited to various economists, business executives and investors: has the Federal Reserve's, along with the other central banks, massive balance sheet run-up (QE) and zero-to-negative interest rate policy created a banker's worst nightmare, i.e. deflation? By way of example, in our current cycle massive amounts of money have been piled into the development of artificial intelligence, production automation (think automated car production, 3D printed homes, robot burger flippers etc) and other technological disruptions, the effects of which are only beginning to be felt and/or understand. As a result, and my final question, are we on the precipice of a massive reduction in the cost-of-goods? If yes, cui bono?